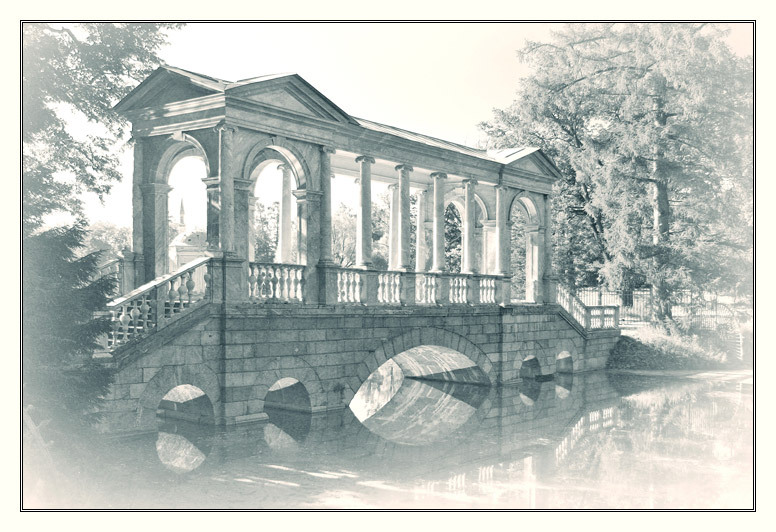 The Marble Bridge (also known as the Palladio Bridge, or the Siberian Marble Gallery) is located near the Large Pond in the landscape part of the Catherine Park. The bridge was erected over a narrow stream linking the Large Pond and several smaller ponds dug in 1769 and 1770. An entire archipelago of seven islands was artificially created here. Swans lived in the houses brightly painted according to designs by the artist A. Rinaldi. To this day they are called the Swan islands and ponds. The marble bridge at the Wiltshire estate in England designed by Andrea Palladio was used as a model for the Marble Bridge created by Vasily Neyelov. During the early 1770s, according to this model (which differed slightly from the original) master Urals stonemasons under the direction of V. Tortori at the Yekaterinburg Stone Factory cut columns, capitals, bases, balances and other details from local blue-gray Gornoshit and white Stanov marble. The construction of the foundations for the Marble Bridge dates to 1773. In 1774 the bridge was assembled from ready materials in Tzarskoje Selo by the master V. Tortori and his assistants Ivan Ivanov, Ivan Grigoriev, Pyotr Petrovsky and Fyodor Shakhurin. Beautiful tonality, details and frame! Великолепная стилизация! Понравилась тональность и сам сюжет! имхо немного пересвечен пну угол..
Давно не видела столь достойных работ! Обработка - перевод в ЧБ (80% красный канал, 20%-зелёный), осветление теней (маска, кривые), небольшое виньетирование белым по краям кадра, легкое тонирование темных областей в циан-голубой тон, светлых - желто-красный тон. i like so much the light you used here.. it adds a special mood to the bridge.. very nice shot..
and thanks for so complete notes.. also the link is quite interesting, specially the virtual tour there!.. i marked it to see more later!.. thanks again!